Whether you’re a homeowner or you’re overseeing an entire business, property security is usually priority number one. Commercial and residential fencing is a great way to provide both security benefits and improve a property’s look. 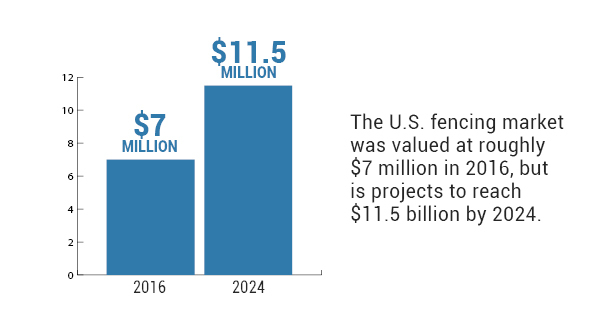 Considering the U.S. fencing market was valued at roughly $7 million in 2016 and is projected to reach $11.5 billion by 2024, now is the time to get your fencing in order. PVC fencing — PVC fencing is one of the most common types of residential fences. It’s affordable, looks great, and is easy to maintain. Pool enclosures — Homeowners don’t often think about fencing off their pools early on, but if there are pets nearby or small children anywhere in the neighborhood, there’s a significant safety risk without fencing. Equestrian fencing — You don’t just want any type of fencing surrounding your property if horses are staying there. You need professionals to construct and install a durable equestrian fence. Chain link — Chain link fencing might not look as nice as some other styles, but it certainly does its job. It’s affordable and will keep out unwanted intruders like rodents and criminals. Pergolas and arbors — Boost your property’s look and value with a quality pergola or arbor. High security fencing — A company needs to be enclosed to ensure security — a quality fence will do just that. Automatic gate operators — If your business generates a lot of employee traffic each day, consider automatic gate operators for quick access. Temporary construction fence — In order to keep pedestrians out of the way of a temporary construction site, having fencing installed surrounding the job will keep them out. No matter what kind of fencing your home or business requires, make sure that you’re working with experienced professionals. If you’re in need of residential fencing, business fencing, or guardrail installation services, give Durham Fence and Guardrail a call right away.